What Can Students Do in Google Classroom? When you, as a student, join a class in Google Classroom, you don’t see everything that your teacher sees, because your teacher is the administrator of the class and, therefore, can do more things. For example, you can’t invite other students to the class, nor can you make assignments. Figure 1 shows what you see when you join a class. Figure 1: A Google class from the student’s perspective. Share a message with the class: On the Stream tab, click inside the Share with Your Class box to write something to your entire class. You can also attach files, YouTube videos, and external links to your message. View assignments: The Assignments box on the left side of the Stream tab lists your assignments and their due dates. Click View All to see all of your assignments. You can click To-Do to see the assignments you have yet to complete, or Done to see your completed assignments. Open an assignment: On the Stream tab, assignments appear in the left Assignments box and in the center column. In the center column, click Open to view an assignment. Comment on assignments: Click in the Add Comment area at the bottom of the assignment box to add a comment about it. Note that you can’t attach files to the comment; you can post only a text message. Your comment is visible to all the other students, plus the teacher. E-mail other students: On the Classmates tab, click the envelope icon to the right of a student’s name to send an e-mail message to that student. 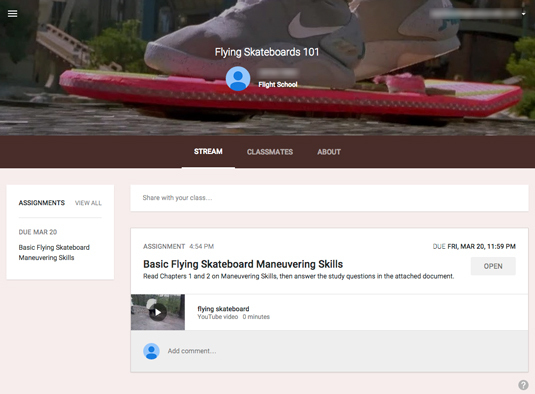 Access the Google Drive for the class: On the About tab, click the Google Drive folder to view the documents that are hosted on the Google Drive for the class. Your teacher may have stored additional materials there, so it’s a good habit to check it frequently.